As a child, I was very fascinated by the food in Harry Potter because it all seemed so alien to me: the decadent stews, the soups, butter as a side, dense cakes made of dried fruit, the grand potatoey-ness of it all. For years I thought “watercress” was a kind of meat because its Italian name was so unfamiliar. There is a cafe in the Studios, but it serves the most generic cafe food you can think of. It also serves Butterbeer and charges you an extra £3 for the pleasure of having your drink in a cheap-looking plastic tankard. The drink itself is a slightly sickly cream soda with an inoffensive whipped marshmallow fluff topping made to look like a shiny, unrealistic head. 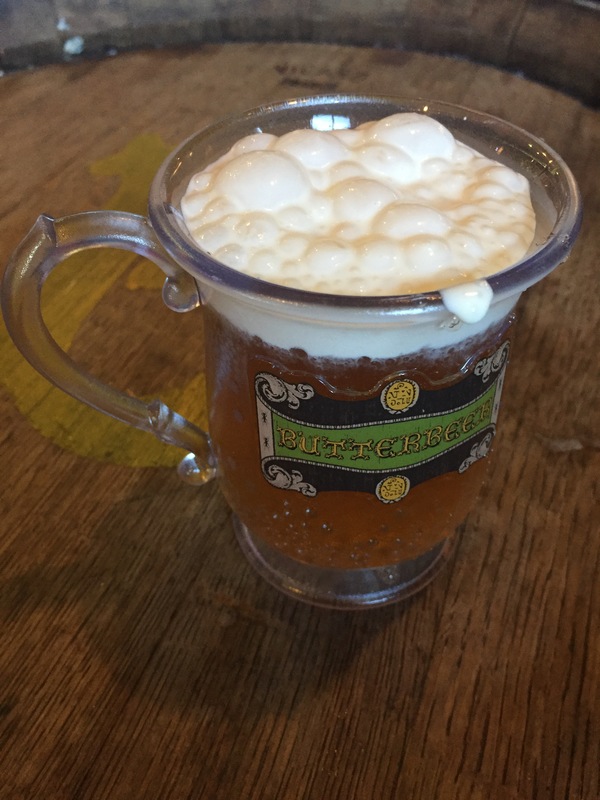 As an adult, what I like the most about fictional Butterbeer is that it has inebriating powers – i.e., it was alcoholic and drunk by teens, in true British spirit. This version also could have used some whiskey. 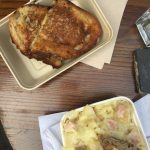 I love Maltby St Market; but I hate it, too. The absurd choice of dishes and cuisines throws me in a panic and I always order something I don’t really want and then second-guess my decision-making skills. This visit was no exception. Tartiflette seemed like a good idea (mounts of potatoes, ham and Reblochon – what could go wrong) but it really doesn’t possess the magical comforting abilities I ached for when it’s 18 degrees on a grey September day. It needed snow to work. My second choice, the fish finger sandwich at Shoal Food was a perfect concoction of crispy chunks of fish, all flaky and delicate inside, in a shiny, sturdy bun. 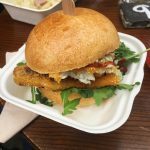 I love any fish finger sandwich (yes, even the orange-coloured supermarket fish fingers with Lurpack spread and the whitest plastic bread) but this one was genuinely delicious, especially washed down with my favourite Negroni in the whole world at Little Bird Gin. 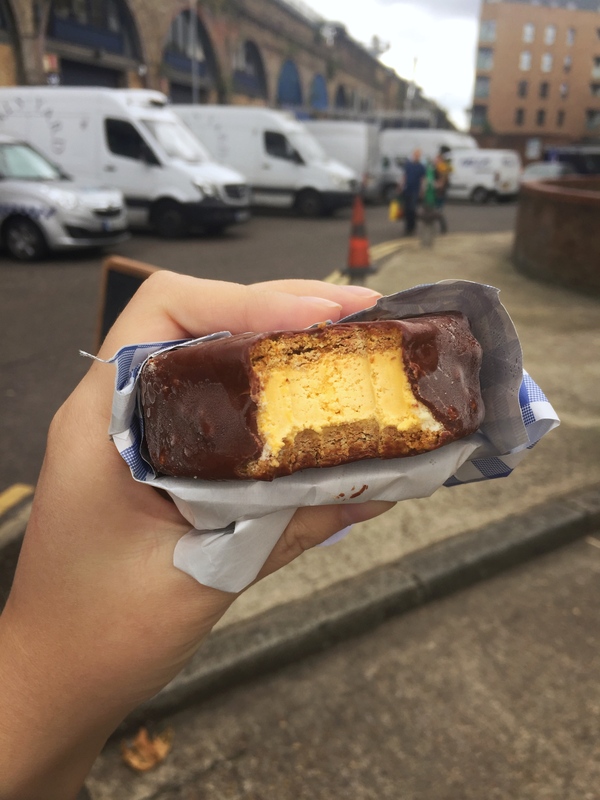 I could not part without trying an ice cream sandwich from Happy Endings, “the Malty One”; it was a wonderful little thing of creamy, nutty malt ice cream, snugly hugged by chewy oat cookies with a slightly salty edge. Chocolate was involved, too. Stoke Newington is like this pretty village where everything looks boutiquey and made to be photogenic, and it maybe has the highest concentrations of restaurants you have to queue for (probably not true, but it feels like that when you’re hungry and will have to wait for forty endless minutes to get your hands on some labna). 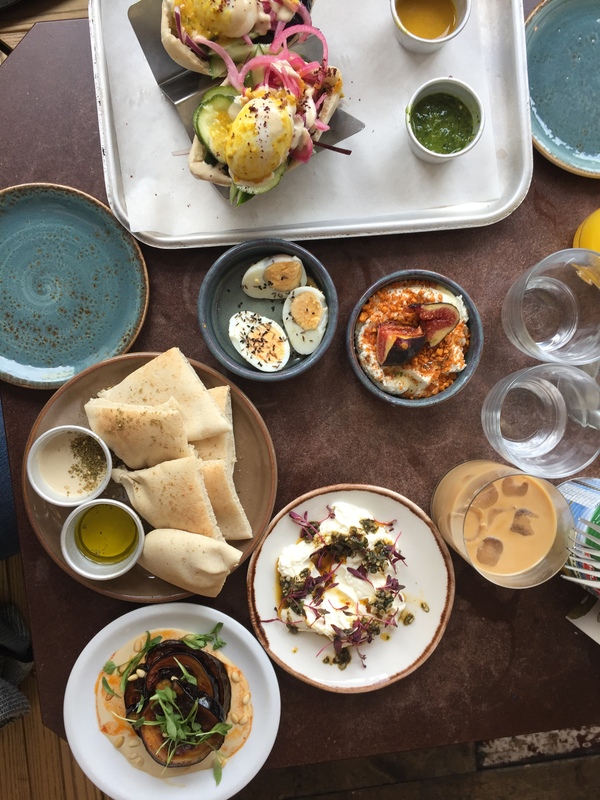 The Good Egg serves Israeli food in a busy, buzzy restaurant. 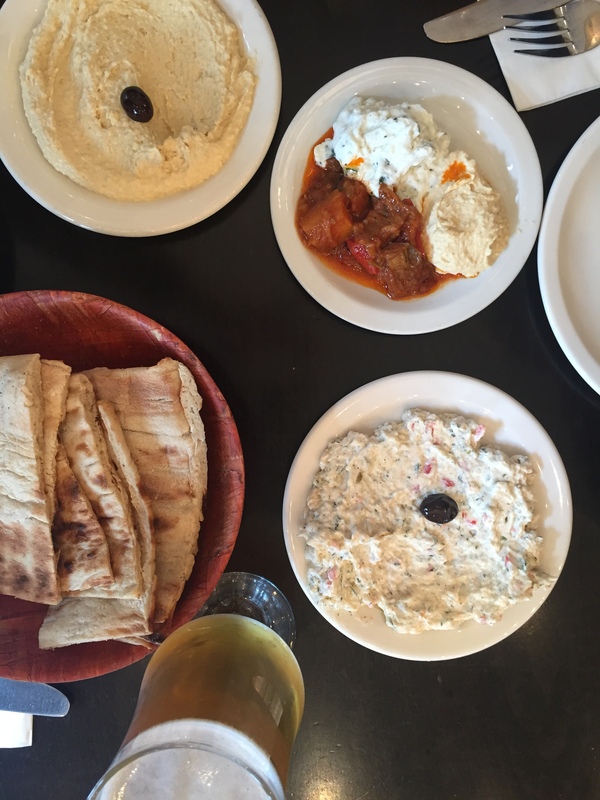 For breakfast, they serve smaller plates, or larger options (pittas, whitefish bagels and the likes). We had melty eggs with everything seasoning (onion, garlic, sesame, caraway seeds and probably something else, but the sesame really did most of the work); perfect, tangy, silky labna delicately dressed with tiny greens; fluffy pitta with olive oil; sharp, smoky aubergine marinated in nutty tahini; airy whipped feta with the ripest jammiest black fig on top. Everything is balanced, tangy, creamy, honey-sweet, feta-salty. By the time I was done, I was ready to queue all over again. When I moved to Berlin, Turkish restaurants were the biggest surprise for me. Before then, my only experience of Turkish food were late night Doner kebabs – deliciously fatty, salty, doused in chilli sauce. But in Berlin, Turkish restaurants were lovely places that offered generous portions of hummus, thin sheets of Turkish bread, grills piled high, diminutive glasses of fruity tea and wobbly baked rice pudding – they were something else entirely. There’s a stretch of the A10 where the smell of car fumes is miraculously covered by the aroma of grilled meat from the many Turkish cafes and restaurants, mainly specialising in wood-fired food. Mangal 2, with its unassuming decor, is among them. Inside, Alex and I shared lamb kofte, our arms crossing while attempting to mop up the yoghurt dip, the sheer pleasure of conviviality in the interactiveness of a dip. We had hummus, coarse and creamy, adorned by a single black olive, dark and sticky like a prune, and an aubergine dip which was a roller-coaster of smokiness, pungent garlic, and cooling mint. Then there was smoky charred lamb kofte on a pile of bread, tomato sauce and yoghurt, served with a generous amount of rice. All of this with Turkish bread, so reminiscent of pizza bianca to me, still warm from the oven and slightly charred in places. It’s the sort of place you’ll want to go time and time again – its reliability the perfect accompaniment to a date, a catch-up with a friend you haven’t seen in a while, meeting your parents. Or a takeaway to be eaten in front of the TV. Stranger Things is coming back soon, after all.